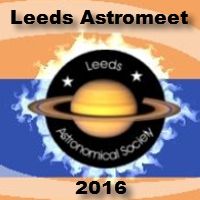 This year's Leeds Astromeet 2015 is on Saturday 7th November. "Happy Landings: Huygens at Titan, Philae and Rosetta at comet 67P"
"Gravity sand and LIGO was listening"
Tickets are again just £10 (£5 concessions). WDAS Members will be travelling in a number vehicles leaving from the Whitby School Car Park at 08:00h. If you'd like to travel with us please let Mark know, to make sure of a place.